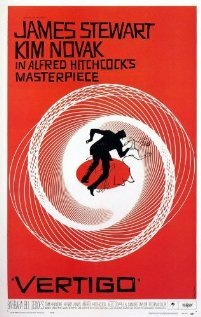 Today it was announced that for the first time since 1962, the number one "best" film in Sight and Sound's movie poll is not Orson Welles' Citizen Kane, but rather Alfred Hitchcock's Vertigo. Very interesting indeed. If I was picking a favourite between the two, I'd have to say I would have gone with Vertigo myself, though I'm not sure I would or could say with any confidence that either was the best film ever made or even my favourite. In fact, I'm pretty sure Vertigo isn't even my favourite Hitchcock. Alfred Hitchcock was the first director whose films I sought out precisely because he had directed them. I think I saw my first Hitchcock film when I was about 10, on television in one of those grainy, jumpy, washed out versions - so much different from the digitally restored wonders you can buy on DVD and Blu-ray now. I'm pretty sure it was Dial 'M' for Murder, and I can remember to this day my mom telling me how clever the solution to the murder case was. I thought it was wonderful. North by Northwest, Rear Window, Rebecca, and Suspicion followed that first experience. Mom and I liked to visit the local Family Video and raid the Classics and Oscars shelves. I'm assuming this is how we came across Vertigo, which blew my mind with its twistiness and its sudden, shocking ending, with its psychological suspense and tortured romance. I can remember very clearly walking home from school one day shortly after I'd seen it (I think I was 13) and telling a friend the plot. I don't think she thought it was quite as amazing as I did. And there were other Hitchcocks - Spellbound and Marnie (which also made a huge impression and sent me off in search of the source novel - I remember I saw both these on VHS from the public library), the rather laughable The Birds, To Catch a Thief, Psycho, Strangers on a Train (watched on a date with Tim on the family room sofa), Notorious (watched on our lovely flatscreen in our basement suite). The most recent Hitchcock I've seen was (finally) Rope. To this day, shamefully, I've never seen any of the silent or British films, which makes me a terrible philistine. But, there's lots of time for those yet. I feel really lucky that the BFI in London is running a giant retrospective of Hitchcock's films this summer and autumn. I've already booked tickets to see Dial 'M' for Murder (in 1950s-style 3D), Vertigo, Marnie, and Rear Window. I'd also like to get up to see Rebecca. I'm really looking forward to seeing these films in a theatre after all these years.